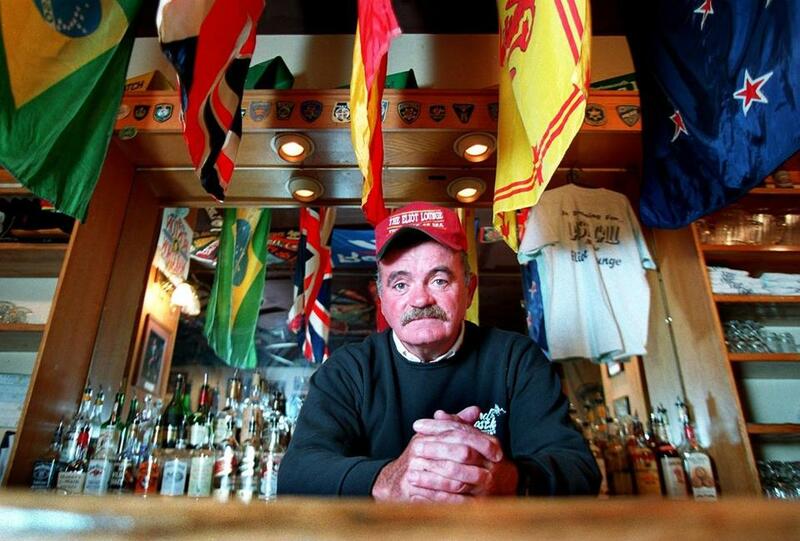 Mr. Leonard, shown in 1996, was a bartender at the famed Eliot Lounge. Tommy Leonard founded the Falmouth Road Race in 1973 on his 40th birthday, and his August classic became a present to generations of runners — from Olympic gold medalists to beginners lucky enough to snag a spot on the starting line. “It’s a dream that became reality,” he once told the Globe, and over the past 45 years, his race achieved a mythical status among many runners second only to the Boston Marathon. Mr. Leonard, who was 85 when he died in Falmouth on Jan. 16, was a magnet for many of the greatest names of the running boom of the mid- to late-1970s. Olympic marathon gold medalists Frank Shorter and Joan Benoit Samuelson ran and won the Falmouth Road Race. Four-time Boston Marathon winner Bill Rodgers finished first in the second Falmouth contest and walked away with what was then the top prize — a Waring blender. Everyone from the elite to the huffers-and-puffers were drawn by the beauty of the course, part of which runs along Vineyard Sound, and perhaps even more by the race’s most attractive feature: Mr. Leonard himself. A fabled bartender, Marine veteran, and marathon runner, he created a summer bookend to the Boston Marathon. 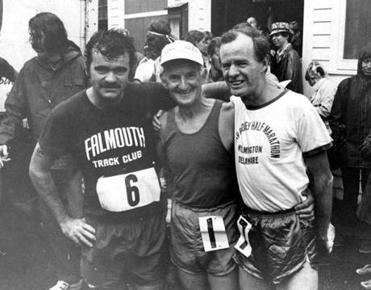 Anyone who has heard the remarkable story of Tommy Leonard, a legendary organizer of the Falmouth Road Race, would never that he was one of a kind and beloved by all. A pioneer of using races to raise money for causes, Mr. Leonard donated the proceeds from the first Falmouth race to pay the expenses for high school girls in town to travel to races..
From left: Tommy Leonard, Johnny Kelley, and Ed O'Connell posed for a photo after the first annual Falmouth Road Race in Falmouth on Aug. 15, 1973. During most of Mr. Leonard’s running years and long afterward, he also was a beloved bartender who championed numerous fund-raisers. The Falmouth Chamber of Commerce named him Citizen of the Year in 2009 for his civic contributions, but to those perched on barstools, he was the man of the evening for decades. Notably, he had tapped beers at the Brothers 4 in Falmouth Heights, and worked for nearly a quarter century at the Eliot Lounge in the Back Bay. “I was interested in making this place a rendezvous, something for apres race,” he told the Globe in 1986 of the Eliot’s reputation as the place to go after the Boston Marathon. Still, for tens of thousands of runners who count the Falmouth Road Race among their most treasured runs, the course along the water remains Mr. Leonard’s lasting achievement. Thomas Francis Leonard was born in Springfield on Aug. 15, 1933. His parents were Edward Leonard, a railroad conductor, and Elizabeth McCarthy, a homemaker. Mr. Leonard and his sister, Grace of Parkville, Md., were young when their parents died of health ailments. Mr. Leonard eventually went to live in Westfield with Frank and Eleanor Tierney. He considered their children — Susan Tierney Oslin of West Dennis and Michael Tierney of Westfield — his adopted siblings. Grace, Susan, and Michael are Mr. Leonard’s immediate survivors. He enlisted in the Marines and, after Parris Island, was assigned to be a guard at the Portsmouth Naval Prison. That afforded off-hours time for long training runs. “When I ran my first Boston Marathon in ’53, the Portsmouth Herald played it up: ‘Local Marine Runs Marathon,’ ” said Mr. Leonard, who eventually ran the race 24 times. Mr. Leonard then returned to Massachusetts to stay, except for moving briefly to Houston in the late 1980s, when the owners of a bar enticed him with a generous offer. 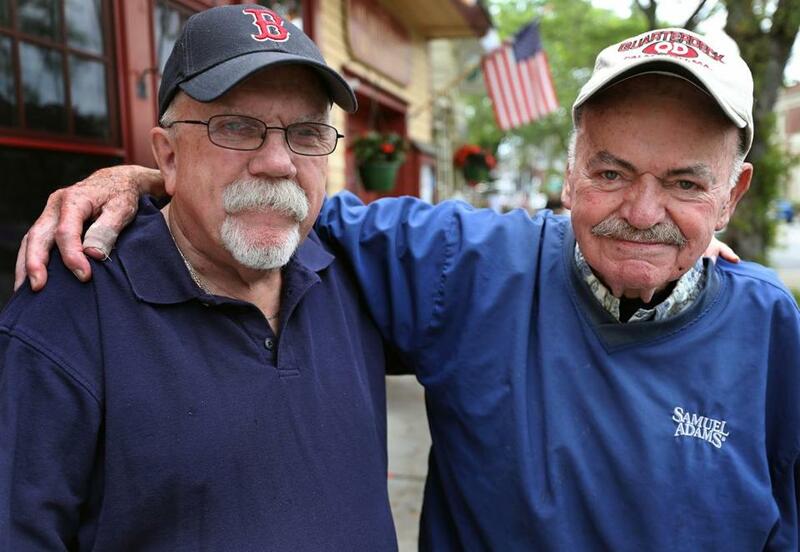 Mr. Leonard (right) worked behind the bard at the Elliot Lounge and Eddie Doyle (left), bartender at the Bull & Finch Pub and the model for Sam Malone of “Cheers,” seen together on Aug. 15, 2017. He lived most of his life in Falmouth and Boston, where his friends included Eddie Doyle — famous for bartending at the Bull & Finch, better known as the “Cheers” bar. The two teamed up to raise thousands of dollars to replace a duckling that had been stolen from the “Make Way for Ducklings” sculpture in the Public Garden. A funeral Mass will be said at 11 a.m. Thursday in St. Patrick Church in Falmouth. Burial will be in Massachusetts National Cemetery in Bourne. Mr. Leonard “had a way of reaching people,” recalled his sister Susan, who said he was as warm a presence with his family as he was with his extended family of runners and customers. Ultimately, even a higher salary couldn’t buy a longer stay away from Massachusetts. Bryan Marquard can be reached at bryan.marquard@globe.com. Follow him on Twitter @BryanMarquard.